Due to its computing power, portable information, good connectivity, proximity to users, multimedia hardware such as cameras, and localization hardware such as GPS, the smartphone is positioned as the primary connection device for the future Internet. Our work focuses on the testing of data communication protocols for smartphones over cellular networks. The performance of communication protocols will play an important part in the evolution of mobile data services. New and more demanding services are expected for the future Internet, requiring new protocols for content distribution (multihoming protocols allowing the ample range of communication technologies embedded in mobile devices to be exploited), new connectivity strategies (distribution of resources due to the high mobility of users) and new application requirements (multimedia content, point-to-point, real time etc). The energy consumption of these new services is worth noting. Smartphones being mobile devices, battery life needs to be optimized in order to safeguard their main functionality: to be in contact with the rest of the world, anytime and anywhere. In that complex context, preparing for the deployment of new mobile services requires more than simulations. To evaluate and test factors such as usability, accessibility, availability and performance, we need to take into account real implementation and deployment constraints, real users and real mobility patterns. Realistic field trials are thus required. 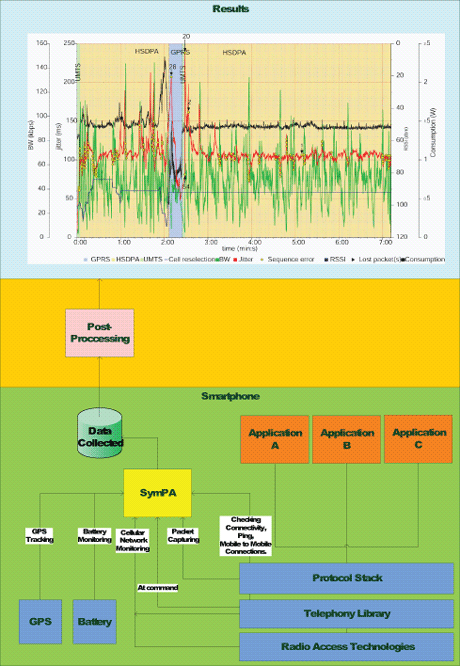 To cover all these issues, we have developed SymPA (Symbian Protocol Analyzer). SymPA is a software tool that runs on commercial Symbian OS smartphones, so third-party developers can use it to debug their applications in the real world. It can also be used to analyse the behaviour of third-party mobile applications and the performance of cellular networks from the point of view of mobile users. Packet capturing is SymPA's main functionality. It enables the analysis of mobile protocols implemented by new applications and of the performance of different data flows over cellular networks. Data traffic is correlated with information obtained by monitoring on the cellular network the radio access technology in use, quality-of-service profile parameters, received signal strength and cell information (network identifier, cell identifier, country code, location area code etc). That correlation helps us to identify issues such as changes in the radio mode (GSM, WCDMA, HSDPA, HSUPA etc), cell reselections or link outage, and their effect on IP data traffic. Monitoring the battery consumption means the power profile of a given application and its relation to the radio access technology in use can both be characterized. This functionality is crucial to optimizing applications for battery life. All this information is accompanied by location data obtained from the GPS tracking function, which enables geographical positioning of the collected data. Finally, SymPA incorporates active functionalities that check the IP connectivity of the mobile device and characterize the round-trip times of data connections and direct mobile-to-mobile connections. An AT command interface is also provided. Figure 1: Performance of SymPA and the results obtained during post-processing of the collected data. Figure 1 illustrates the performance of SymPA and the results obtained during post-processing of data collected by it. The graphic represents three kinds of information. Traffic data such as jitter, delay, lost packets and sequence error have been obtained by processing packet capture with a network protocol analyser. The figure's background colour represents the technology in use, highlighting the burst of lost packets that takes place when there is a handover between HSDPA and GSM networks. It is also evident that power consumption increases when the received signal strength decreases before the handover to the GSM network, and that it decreases in GSM. This kind of correlation between data traffic, radio measurements and battery consumption enables us to characterize data communication performance over cellular networks. This tool can also be used by operators who can take advantage of its functionalities to detect underperformance issues in their networks or to analyse the quality of service perceived by final users. The analysis of the data traffic received by the user's terminal allows the bandwidth perceived by customers to be measured, along with the real impact of radio issues on a user's experience.